My recent article about the decision-making process behind the second part of the Hills Road cycleway seems to have been read widely. Understandably, however, most local residents want to move away from discussing the process and get on with looking at the proposed outcomes. They turned out in force at the St John The Evangelist’s meeting room on Thursday evening to see the plans. Unfortunately, many were unnecessarily disappointed. A couple asked me if they’d missed the presentation, so I had to explain that there wasn’t a spoken ‘presentation’, they were just supposed to look at the engineering drawings on the display boards and the rest was up to them. Of course, almost nobody can work out what engineering drawings will translate to in practice, so many people just gazed at them hopelessly. The real information could be gained by quizzing the occasionally overwhelmed project representatives present: Vanessa Kelly, Project Officer for the Council’s Cycling Projects Team, and Richard Bensley, Highways Design Manager at contractor Skanska UK. Both did their best to answer all sorts of questions in informal groups, but I know that many attendees didn’t actually realise they were there. At least we got an exhibition of sorts, which is a step up from what might have happened in the past. But we really needed some visualisations, which aren’t hard to do, and a five-minute spoken introduction every half-hour would have changed everything. Inevitably, many people wanted to know about the proposed five-month full road closure. Our County Councillor, Amanda Taylor, has been vocal in her opposition to this. I was particularly alarmed by the commenter on my previous article who pointed out that the simple diversion via the Fendon Road roundabout wouldn’t be as trouble-free as it looks on paper. This is because in the morning there’s already a queue of traffic waiting to cross into Long Road from Queen Edith’s Way. Adding to this would most likely back the traffic up to the Fendon Road roundabout. Traffic coming up Fendon Road from Addenbrooke’s would see that they couldn’t turn left off the roundabout because of the backed-up traffic, but traffic coming down Mowbray Road and wanting to turn right couldn’t do so, and would enter the roundabout with no exit. I suspected this might create tailbacks right down Mowbray Road and Queen Edith’s Way, so I put these concerns to Mr Bensley. He said: “It’ll be chaos for a couple of days, then everyone will work out alternatives and it’ll settle down. That’s what happens.” If that sounds a bit blasé to you, it may just be realistic. Mr Bensley has experience as a Highways Engineer in this area going back nearly 40 years. I do not. It does seem a worrying approach though. What of the cycleway plans themselves? Sam Davies, as a resident of the affected part of Hills Road, met Lewis Herbert from the City Council and Mike Davies (no relation!) from the Cycling Projects Team before the exhibition, and subsequently convened a small meeting with representatives from the Hills Road Residents Association, to which I was also invited. Sam Davies said that it was very clear from her meeting with Mr Herbert and Mr Davies that the momentum behind the scheme was too far advanced to be able to halt it, and that “the best we can do was to ask them to look again what seemed to us to be the most dangerous elements of the design”, while also urging them to live up to commitments previously made on finishing off Phase 1, including completing the review of that work; and to deliver an acceptable public realm. As a group, we sent this letter to Mr Herbert and Mr Davies on Monday. I hope that most people will agree with our observations and recommendations. There has been no formal response from the team yet on either these or the road closure. However, at least the County Council is aware of the issues and we hope they will have given them serious consideration. We believe that even if the points raised in the letter are incorporated, the scheme is still only the ‘least worst’ compromise. This is what lay behind our request that nothing is done now which would rule out a better solution when, for example, the Addenbrooke’s roundabout is redesigned. Clearly the Phase 1 review should have taken place before embarking on Phase 2. And clearly a landscape architect should have been involved in the design process from the start, because they do have the skills to envisage the aesthetic impact, and offer creative solutions. It is extremely disappointing that this is not standard practice across the county and that the same mistakes will likely be repeated elsewhere. It was good that the public was invited to comment on the plans from the outset. It was good that exhibitions were held to explain the eventual proposals. But both activities could have been done so much better. The failure to explain and provide evidence for the decisions made, especially where they involve an obvious compromise in amenity or aesthetics. Officers need to up their game and ensure clear communications with residents and the wider community right through to the end of the project, flagging up changes to the plans, schedule, etc. and allowing time and opportunity for comment (not a fait accompli). Many of us will be watching them and reporting back. A very good, clear letter. Thanks! The letter does make good points, but surely points 1,2 and 3 are just rehashing the design consultation we’ve already had on this junction. Re point 1: I wondered the same thing, but the issue is that unless you are prepared to reduce junction capacity and only have one car lane, there is only 1.5m for a cycle lane even after reclaiming ~1.5m or so of overgrown shrubbery. And a 1.5m lane between two traffic lanes is the sort of thing a lot of people find scary, which is why they decided to keep it on the left. Do we have numbers for what proportion of people go left, ahead, right? (I only ever go left so really have little experience of the other movements). I’d be very happy with there only being one lane and reduced junction capacity, but getting the council to reduce capacity anywhere is incredibly difficult, because they are scared stiff of the ‘motor lobby’. Even though it’s quite obvious that it’s impossible to cater for growth by having everyone driving about, because we are already at capacity, and only modal shift to bikes and buses will work. And that requires making biking and bussing more attractive than driving, or actually controlling cars (with closures, congestion charging, pollution controls, or entry-point volume limits), which too many people are still resisting, even though it’s inevitable if we actually want to improve things. So are you proposing just one southbound lane? Or do you think that a 1.5m central lane is in fact acceptable on balance, or would you steal a bit more from the pavement? A single-stage crossing could reduce the central island size, and we have one on the south side, so that ought to be possible. What do people currently do if they arrive at this junction wanting to go diagonal, during the ‘traffic-flow’ period? Move into the RH traffic lane? Wait on the hashing? Stay left till at the junction, then stick their arm out and go for it? 1. Closing Hills Road bridge some years ago for repairs/development of the guided bus underpass, showed that while there is increased congestion commuters are adaptable creatures and tend to find an alternative means to complete their daily journey. This will happen with the proposed Hills Road closure thus lessening the expected impact. 2. The option of keeping Hills Road open (with presumably traffic lights to allow single lane passage) will cause even longer lines of stationary traffic in both directions. This will result in increased pollution, especially from diesel vehicles affecting the health of residents but more importantly the commuters themselves as they are most at risk from the exhaust fumes from the car in front. While kerbside measurement suggest that pollutions levels are within legal limits, experience of consultants at Addenbrookes and elsewhere shows that they are encountering many more respiratory cases, especially amongst children. More pollution will occur with either option but extending the period of disruption which would occur if Hills Road were kept open and the work slowed would severely add to this. Let just get the job done. 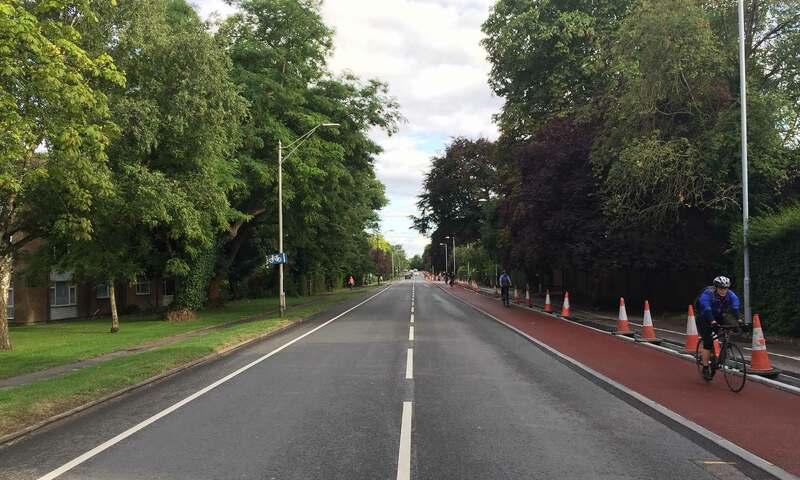 It is probably relevant to this discussion to point out that the current roadworks on Trumpington Road, alongside the Botanic Gardens, will continue well into the summer. The phase 2 works on Hills Road are due to start in a couple of weeks. So both routes into the city from the south will be simultaneously blocked for several months – I’m not optimistic that there is enough redundancy in the road network to be able to cope with that degree of disruption.